Fuel (Gas) pricing growing and growing. Yours vehicle fleet (special machinery) require more and more money on fuel costs. Your earnings slowly, but steadily declining. You do not have the opportunity to influence the growth of fuel prices, but to reduce the cost of fuel consumption is in your best. This decision is quite simple: full control over the use of your fuel and lower transaction costs than the rational use of fuels. 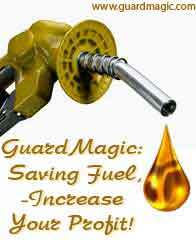 "GuardMagic fuel saving system" is recompenced in 3-6 weeks, primarily due to fuel theft (drain) and fuel fraud decrease. For example, vehicle fleet consist of 200 trucks. Using "GuardMagic fuel control system" will allow you for the period 2-3 month increase your fleet at one "Actros". The possibility of such truck fleet increasing will happen only by termination of fuel fraud. Think. Do you want every three month to lose or present to anybody a one new "Actros"? not the best driving directions and traffic parameters. It means that in general you will need to have the information about fuel drain, partial fuelling, real fuel consumption and real trip of your vehicle and movement parameters. Personal Computer with special fuel monitoring software for storing all data and analyzing it (or monitoring service). GuardMagic fuel monitoring and analyzing system ("Real Time" or "Off-Line") in a full automatically mode, "day & night" collects and stores detailed information about fuel tank contents and fuel usage. 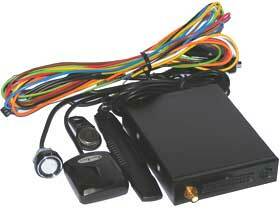 Our special "Fuel & GPS Data Logger" GuardMagic mTF modules series collect all data from fuel level sensors and store it in internal memory for future analyzes. - to prevent unauthorized use of transport. The special monitoring software *(SmartTracer) collect all this data from your vehicle fleet and generate the series of special reports that allow you to see the real detailed pictures of your vehicle activity and fuel usage. Our special vehicle modules: GuardMagic VF2 and GuardMagic VB collect all data from fuel level sensors and send this information to monitoring server. The monitoring server (monitoring service or monitoring software) collect all this data from your vehicle fleet and generate the series of special reports that allow you to see the real detailed pictures of your vehicle activity and fuel usage.